Flip phones. Who doesn't love them? They represent the 2000s to us, and they represent the best of Motorola to us, crazy Moto fans. These phones have something special, that we can't tell what it is. Feeling cool while closing the flip, pretending to make calls just to open it, and open-close it until the phone begs you to stop. It's just an awesome feeling. That's why this is one of my most beloved pieces from my collection. This is the 2012 MotoSmart Flip (XT611). 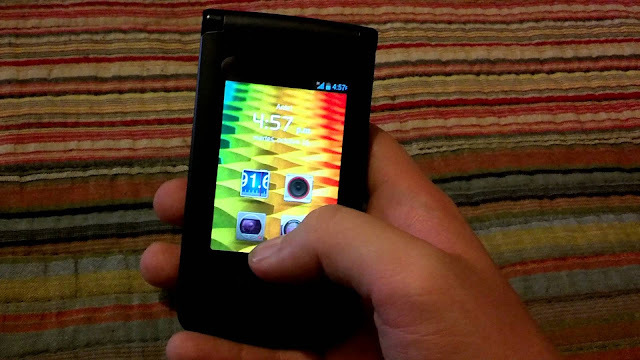 This phone was a Latin American exclusive in the middle of the storm, after Google acquired Motorola and started firing everyone and cancelling awesome projects. This device was lucky to see the light and it became the last Motorola flip phone EVER. The phone looks amazing, though it was totally under-powered. A 3.2" screen (HVGA), 800MHz processor and 512MB of RAM. And you could only install 5-6 apps, otherwise it would give you an annoying no-memory notification (unless you rooted it and installed Link2SD, remember those days?). It came with an awful 5MP camera and its wifi connection was slower than any other device ever released. But it was an freaking Android-powered flip phone. Its external glass, similar to the MotoMING, or (Krave ZN4 for our American friends) let you use the phone with the flip closed so you could take pictures, listen to music or read text messages. It was such an awesome feature alone that all the drawbacks seemed to disappear. I always go back to the Smart Flip when I'm feeling nostalgic, but then I power it on and remember it's a Gingerbread phone running on 512MB of RAM. That's when I remember why I didn't come back to using it the last time, and I put it away. But it sure lies in my collection as one of my finest pieces. It's the last flip phone Motorola ever released. Who knows, maybe Lenovo asks Moto to release another flip phone one day. Many people will be happy when that happens. Until then, I will cherish this little, under-powered gem.